Donna Christian was born on September 19, 1945, in Teaneck, New Jersey, to Almeric L. Christian and Virginia Sterling Christian. Her mother was a New York native and her father, who served in the U.S. Army in World War II, returned to his native Virgin Islands with his young family after earning a law degree at Columbia University. Almeric became a U.S. attorney and then a chief judge of the Virgin Islands District Court. Donna Christian, who later described herself as a girl who “lived in the library,” attended boarding schools in Puerto Rico and New York.2 She earned a B.S. from St. Mary’s College at Notre Dame in South Bend, Indiana, in 1966 and an M.D. from the George Washington University School of Medicine in 1970. Christensen began her political career in 1980 as part of the Coalition to Appoint a Native Judge, which emphasized judicial appointments from within the community and later on as part of the Save Fountain Valley Coalition, which called for the protection of St. Croix’s north side from overdevelopment. She served as Democratic National Committeewoman from 1984 to 1994 and vice chair of the Territorial Committee of the Democratic Party of the Virgin Islands and on the Platform Committee of the Democratic National Committee. From 1984 to 1986, she served as a member of the Virgin Islands board of education and was appointed to the Virgin Islands Status Commission from 1988 to 1992. In 1997, as a freshman Member of the 105th Congress (1997–1999), Christensen won a seat on the Resources Committee (renamed the Natural Resources Committee in the 110th and 111th Congresses, 2007–2011), a key assignment because it had oversight of the affairs of the offshore territories. She remained on that committee through the 111th Congress, serving as chairwoman of the Insular Affairs Subcommittee in the 110th Congress when Democrats regained the House majority. In the 111th Congress, Christensen earned a seat on the Energy and Commerce Committee, which had jurisdiction over much of the healthcare system in the U.S. She served on that panel until she left the House in 2015. 1Kaitlyn Rabach, “Saint Mary’s Alumna Serves the U.S. Virgin Islands,” 11 October 2013, The Observer (University of Notre Dame): 1. 2Politics in America, 2014 (Washington, D.C.: CQ-Roll Call Inc., 2013): 1115. 4“Christian-Christensen, Donna,” in Charles W. Carey, Jr., African American Political Leaders (New York: Facts on File, Inc., 2004): 47–48. 5“Christensen, Donna Marie,” in The Black Past: Remembered and Reclaimed, at http://www.blackpast.org/aah/christensen-donna-marie-christian-1945 (accessed 15 December 2016). 6Office of the Clerk, U.S. House of Representatives, Election Statistics: 1920 to Present, http://history.house.gov/Institution/Election-Statistics/Election-Statistics/. 7Politics in America, 2014: 1114–1115. 8Ibid; Aldeth Lewin, “Christensen Renews Call for Independent V.I. CFO,” 29 December 2011, Triboro Banner, at http://www.triborobanner.com/news/christensen-renews-call-for-independent-v-i-cfo-1.1250587 (accessed 23 December 2016); quotation in, “Christensen’s CFO Bill Passes House Committee,” 25 April 2013, St. John Source, at http://stjohnsource.com/content/news/local-news/2013/04/25/christensen-s-cfo-bill-passes-house-committee (accessed 23 December 2016). 9Congressional Record, House, 110th Cong., 1st sess. (11 December 2007): 15224. 10For full House debate and passage see, Congressional Record, House, 110th Cong., 1st sess. (11 December 2007): 15219–15227. 11Amending the Joint Resolution Approving the Covenant to Establish a Commonwealth of the Northern Mariana Islands, and for Other Purposes, H.Rept. 110-469, 110th Cong., 1st sess. (4 December 2007). 12Report on Legislative and Oversight Activities, Committee on Natural Resources, U.S. House of Representatives, H.Rept. 110-925, 110th Cong., 2nd sess. (2 January 2009): 20–21. 13Latrina Antoine, “Rep. Donna Christensen Prepares for V.I. Governorship,” 4 October 2014, Afro-American Red Star (Washington, D.C.): A1. 14“Official Biography of Donna M.Christensen,” http://www.house.gov/Christianchristensen/biography.htm (accessed 11 June 2003); Politics in America, 2004 (Washington, D.C.: Congressional Quarterly Inc., 2003): 1130. 15J. Zamgba Browne, “Healing Disparities in Healthcare System Toward People of Color,” 22 March 2001, New York Amsterdam News: 17. 16Addressing Disparities in Health and Healthcare: Issues of Reform, Hearing before the Ways and Means Committee, U.S. House, 110th Congress, 2nd sess. (10 June 2008): 7. 17Politics in America, 2014: 1114–1115. 18Kathleen Wells, “Q&A with Congressional Delegate Donna Christensen and the House Health Care Bill,” 8 December 2009, Philadelphia Tribune: n.p. 19Bill Kossler, “Christensen Kicks Off Campaign for Governor with Running Mate Ottley,” 9 March 2014, St. Thomas Source, at http://stthomassource.com/content/news/local-news/2014/03/09/christensen-kicks-campaign-governor-running-mate-ottley (accessed 19 December 2016). 21Election System of the Virgin Islands, 2014 General Election Results, at http://www.vivote.gov/sites/default/files/officialresults/Territory%20wide.HTM (accessed 20 December 2016). 22Election System of the Virgin Islands, 2014 Run-Off Election Results, at http://www.vivote.gov/elections/2014-run-election (accessed 20 December 2016); “Kenneth Mapp Elected Governor of the United States Virgin Islands,” The Virgin Islands Consortium, 19 November 2014, at http://viconsortium.com/politics/kenneth-mapp-8th-elected-governor-united-states-virgin-islands/ (accessed 19 December 2016). 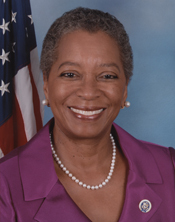 "Donna M. Christensen" in Black Americans in Congress, 1870-2007. Prepared under the direction of the Committee on House Administration by the Office of History & Preservation, U. S. House of Representatives. Washington: Government Printing Office, 2008. "Donna M. Christensen" in Women in Congress, 1917-2006. Prepared under the direction of the Committee on House Administration by the Office of History & Preservation, U. S. House of Representatives. Washington: Government Printing Office, 2006.